This four-stop home or practice organ design provides a middle option between our two- and six-stop organs. A key requirement for productive literature practice is the the availability of open eight-foot tonal center on both manuals. While balanced in loudness the stops are very distinctive tonally. The Principal is of metal while the Claribella is of tapered wood for maximum differentiation while still blending into a full sound with the coupler manual. 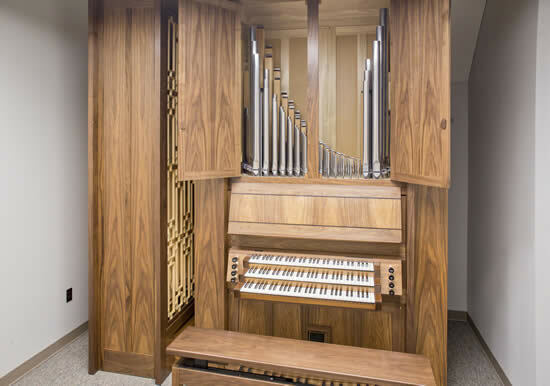 This is similar to our successful two-stop design, but the addition of the four-foot Flute creates chorus and contrast possibilities. The Flute is a single stop, alternatively available with either eight-foot stop. The Flute blends with both stops by having a capped flute character in the bass and then transitioning to open flute character in the treble. The pedal octave coupler also allows the Flute to work as a cantus firmus stop. The Subbass extends the tonal resources in the other direction. For tuning and service access, this stop is housed in a separate casework to the left of the manual casework. All four stops are full compass and no stops share pipes. The coupler manual provides additional practice options for thumbing up or down as required by different literature. The organ is completely mechanical in both key and stop action. The manual case encloses a large bellows but the blower is located externally. All pipes reside inside the two caseworks for protection and tonal blending. The doors above the music rack allow manual regulation of the loudness like a swell mechanism. The Oklahoma instrument has a walnut case, bone manual keys, parallel-concave (with radiating sharps) pedalboard, and an adjustable bench. Other alternatives can be specified to meet the needs of our clients. Please contact us to discuss a fully-considered solution specific to your situation.